Is I-Banking Not Cool Anymore? Guess what? Much to the chagrin of investment bankers, i-banking just might not be that cool anymore. Actually, it never was cool, but it sure did pay out above-and-beyond any other post-grad gig. 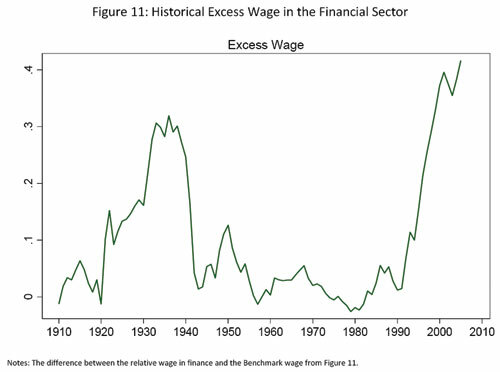 And the below graph testifies to that: it plots excess wages paid to professionals in the financial sector over the past one-hundred years. The line is steeper than Mount Everest (on the way up). For those of you who are either involved in or angling for a gig in the financial sector, this comes as no surprise. But as Paul Kedrosky points out, it also shouldn’t be a surprise that the generous payout to the financial sector has led to a mis-allocation of talent to it. As "cool" as post-college investment banking jobs have been over the past ten years, they may soon be going the way of the dodo. If you believe that a large segment of America's most talented grads follow the money trail, then as it starts to lead away from the financial sector, so will America’s top grads. Why would you want to sell your soul for pay that’s comparable to, let’s say, a gig in the green tech space? And green tech is actually good for America!!!! Better yet, maybe a few very talented grads who once were considering investment banking are now considering medicine? Or maybe even teaching? Who knows what the outcome will be. But one thing is for sure. As a result of the financial crisis, financial sector opportunities have significantly dropped and so has the pay. Maybe it’s finally time to covet a post-college job other than i-banking.